Across the political spectrum, government officials and advocacy groups are calling for Virginia Gov. 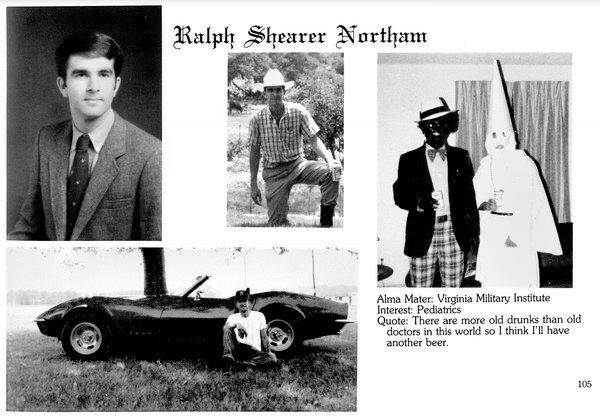 Ralph Northam’s resignation after media reports of a racist photo on his page in a college yearbook. The photo, from Northam’s 1984 medical school yearbook, features two men — one dressed in blackface and the other in a Ku Klux Klan robe. On Friday, Northam apologized for the photo. On Saturday, he said that it was not him in the picture after all and that he would not resign. Calls for Northam’s resignation began Friday night and continued throughout Saturday. They came from both sides of the aisle, including Virginia Democrats, House and Senate Republican leaders and the Virginia Legislative Black Caucus. “When the racist picture first emerged Friday, we were shocked and repulsed. The photo is disturbing and offensive, as unacceptable in 1984 as it is today,” said a statement issued by House Speaker Kirk Cox and other Republicans. Susan Swecker, chair of the Democratic Party of Virginia, issued a statement Saturday calling for Northam’s immediate resignation. Saturday night, more than a dozen progressive groups — including Planned Parenthood, Equality Virginia and environmental and labor organizations — issued a statement reiterating their call for Northam to leave office. “We heard what the Governor said today and we are not only unmoved but even more disgusted in his actions and changing stories. We reaffirm our demand that he must immediately resign,” the statement said. New Virginia Majority, Chesapeake Climate Action Network and Progress Virginia are among other groups that have called for Northam to step down. This story was published by such news outlets as Richmond2Day, Patch and the Suffolk News-Herald.